Zazaki, also called Zaza, Kirmanjki, Kirdki and Dimli, is an Indo-European language spoken primarily in eastern Turkey. The language is a part of the northwestern group of the Iranian section of the Indo-European family, and belongs to the Zaza-Gorani and Caspian dialect group. Zazaki shares many features, structures, and vocabulary with Gorani. 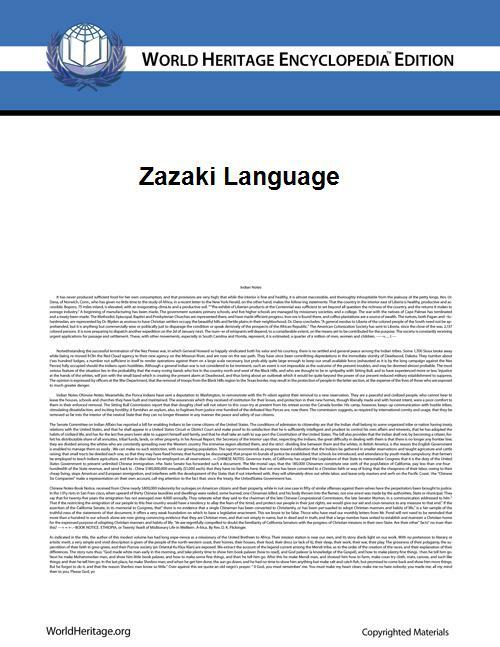 Zazaki also has some similarities with Talyshi and other Caspian languages. According to Ethnologue (which cites [Paul 1998]), the number of speakers is between 1.5 and 2.5 million (including all dialects). According to Nevins, the number of Zazaki speakers is between 2 and 4 million. Zazaki is an Iranian language in the Indo-European family. From the point of view of the spoken language, its closest relatives are Mazandarani, Hewrami, Gilaki and other Caspian languages. However, the classification of Zazaki has been an issue of political discussion. A minority of linguists classify it as a subdialect of Kurdish. There are many Zazaki-speakers who identify themselves as ethnic Kurds while others do not. The US State Department "Background Note" lists the Zazaki language as one of the major languages of Turkey, along with Turkish (official), Kurdish, Armenian, Greek, and Arabic. Linguists connect the word Dimli with the Daylamites in the Alborz Mountains near the shores of the Caspian Sea in Iran and believe that the Zaza have immigrated from Deylaman towards the west. Zazaki shows many connections to the Iranian languages of the Caspian region, especially the Gilaki language. The Zazaki language shows similarities with (Hewrami or Gorani), Shabaki and Bajelani. The Gorani, Bajelani, and Shabaki languages are spoken around the Iran-Iraq border; however, it is believed that speakers of these languages also migrated from Northern Iran to their present homelands. These languages are sometimes classified together in the Zaza-Gorani language group. Northern Zazaki: It is spoken in Tunceli, Erzincan, Erzurum, Sivas, Gumushane, Mus (Varto), Kayseri (Sariz) provinces. Central Zazaki: It is spoken in Elazığ, Bingöl, Solhan, Girvas and Diyarbakır provinces. Southern Zazaki: It is spoken in Şanlıurfa (Siverek), Diyarbakır (Cermik, Egil), Adiyaman, Malatya provinces. The first written statements in Zazaki were compiled by the linguist Peter Lerch in 1850. Two other important documents are the religious writings of Ehmedê Xasi of 1899, and of Usman Efendiyo Babıc (published in Damascus in 1933); both of these works were written in the Arabic script. The use of the Latin script to write Zazaki became popular only in the diaspora in Sweden, France and Germany at the beginning of the 1980s. This was followed by the publication of magazines and books in Turkey, particularly in Istanbul. The efforts of Zaza intellectuals to advance the comprehensibility of their native language by using that alphabet helped the number of publications in Zaza multiply. This rediscovery of the native culture by Zaza intellectuals not only caused a renaissance of Zaza language and culture but it also triggered feelings among younger generations of Zazas (who, however, rarely speak Zazaki as a mother tongue) in favor of this modern Western use of Zazaki, rekindling their interest in their ancestral language. The diaspora has also generated a limited amount of Zazaki language broadcasting. Moreover, after restrictions were removed on local languages in Turkey during their move toward an eventual accession to the European Union, Turkish state-owned TRT television launched a Zazaki TV program and a radio program on Fridays. As with a number of other Indo-Iranian languages, Zazaki features split ergativity in its morphology, demonstrating ergative marking in past and perfective contexts, and nominative-accusative alignment otherwise. Syntactically it is nominative-accusative. Among all Western Iranian languages only Zazaki and Kurmanji distinguish between masculine and feminine grammatical gender. Each noun belongs to one of those two genders. In order to correctly decline any noun and any modifier or other type of word affecting that noun, one must identify whether the noun is feminine or masculine. This distinguishes Zazaki from many other Western Iranian languages that have lost this feature over time. For example, the masculine preterite participle of the verb kerdene ("to make" or "to do") is kerde; the feminine preterite-participle is kerdiye. Both have the sense of the English "made" or "done". The grammatical gender of the preterite-participle would be determined by the grammatical gender of the noun representing the thing that was made or done. The linguistic notion of grammatical gender is distinguished from the biological and social notion of gender, although they interact closely in many languages. Both grammatical and natural gender can have linguistic effects in a given language. Words in Zazaki can be divided into five groups in respect to their origins. Most words in Zazaki are Proto-Indo-European, Proto-Indo-Iranian and Proto-Iranian in origin. The fourth group consists of words that developed when Zazaki speakers divided from the Proto-Iranian language. The fifth group consists of loan words. Loan words in Zazaki are chiefly from Arabic and Persian. Brigitte Werner. (2007) Marburg, Germany. Paul, Ludwig. (1998) University of Hamburg. Larson, Richard. and Yamakido, Hiroko. (2006) University of Arizona. Lynn Todd, Terry. (1985) University of Michigan. Gippert, Jost. (1996) University of Frankfurt. Gajewski, Jon. (2003) Massachusetts Institute of Technology. Gajewski, Jon. (2004) Massachusetts Institute of Technology.